I did this walk on Sunday 29th August 2010. The lack of footpaths in this area is making it hard to find circular walks and I had spent a long while deciding the best route to take; in the end I ended up walking over 20 miles just to complete 8.4 miles along the Harcamlow Way. 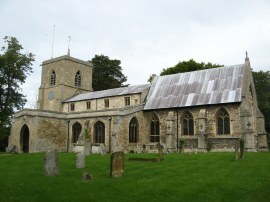 I did however have a good walk and got to see a bit more of the Cambridgeshire countryside than if I had just followed the route of the walk. 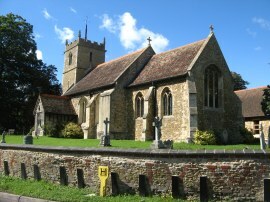 I drove up to Coton where I was able to park on the Harcamlow Way, close to where I had finished my last walk by Coton Church, photo 1. Despite the weather forecast of white cloud the day started very grey and there was also an extremely strong wind blowing, I have mentioned several times before about it being windy when I had been out walking the Harcamlow Way and this was the windiest day yet with plenty of leaves and twigs being blown from the hedges and trees. 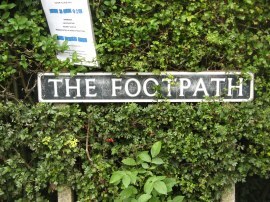 I headed along the High Street and at the end turned to the right along a road known as The Footpath, photo 2. 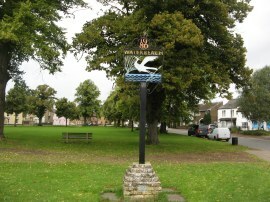 The route follows the road round to the left and then continues straight ahead at the next junction, the route running alongside a recreation ground. 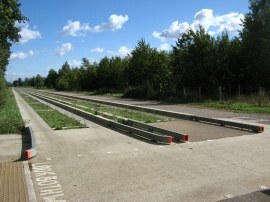 The road soon becomes a surfaced track, which was being well used by cyclists, which heads down through trees to reach a bridge over the M11 motorway. 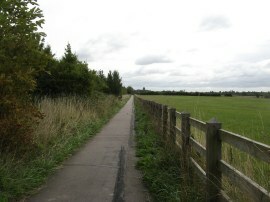 Once over the motorway the route follows a long straight stretch of surfaced footpath, photo 3 running between fields that heads towards the outskirts of Cambridge. 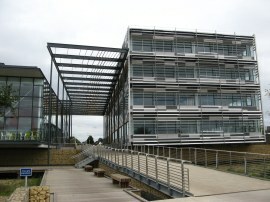 The path passes alongside the recently completed University of Cambridge Hauser Forum, photo 4, on the University’s West Cambridge Campus, and joins a broader cycle path which is followed up to reach Wilberforce Road where the route continues ahead along Adams Road. 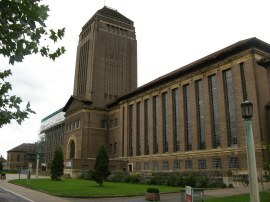 At the end of Adams Road the route crosses Grange Road and joins another cycle path that is followed round to the left where it passes the Cambridge University Library, photo 5, the tower of which I had first been able to see to see on the previous stage. At the end of the footpath the route heads across Queens' Road to join another footpath, Garret Hostel Lane which heads through parkland to reach the River Cam. 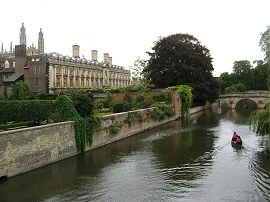 From the bridge over the river there were good views on the right of Clare College, photo 6. 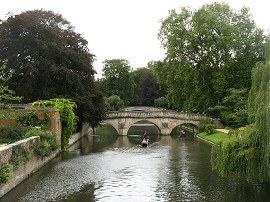 Besides the bridge were a large number of punts for hire, one of which was already in use, heading towards Clare Bridge, photo 7. 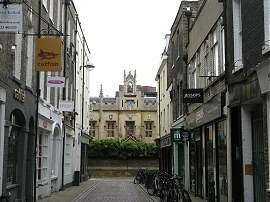 At the end of the Garret Hostel Lane I turned left into Trinity Lane, following the lane round to the right as it ran alongside the walls of Trinity College, photo 8. 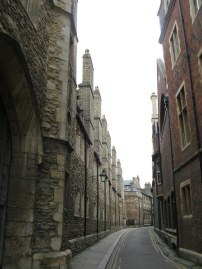 At the end of the lane I turned briefly left into Trinity Street and the right along Green Street from where I could see the buildings of Sidney Sussex College at the end of the street, photo 9. 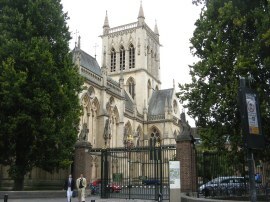 From Green Street I turned to the left, heading down Sidney Street as far as St John's College Chapel, photo 10, where I headed to the right along Round Church Street, passing the eponymous Round Church at the top of the road. From the Ordnance Survey map I was unable to tell if this was the intended route through the city centre but it more or less matched the locations of the green diamonds on the map. At the end of Round Church Street I turned to the left along Park Street before turning right into Lower Park Street which is lined on the right by an attractive row of old cottages. Reaching the end of the road the Harcamlow Way continues ahead through the grounds of Jesus Green, photo 11, following the footpath as it bends gently round to the right to reach Victoria Avenue. 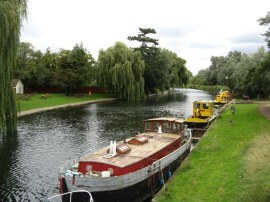 Once over the road it was just a short walk ahead to rejoin the banks of the River Cam, photo 12. Back at the river the route heads to the right along the bank, running alongside Midsummer Common. 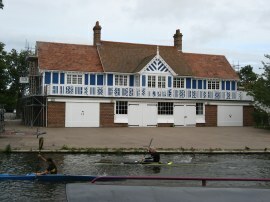 On the opposite bank the river was lined by a large number of rowing club houses, photo 13. After crossing under the A1134 the route joins a minor road, the appropriately named Riverside, running along the edge of river. This is followed down to reach Stourbridge Common, photo 14, where the route leaves the riverside, bearing to the right along a track that heads towards a railway bridge. 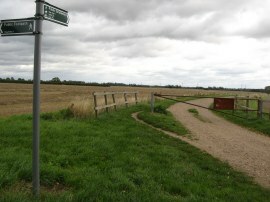 The Harcamlow Way is now sharing its route with the way marked Fen Rivers Way and there was an information board about the path at the entrance to the common. Stourbridge Common was being grazed by cattle and the three distinct types, the only one of which I recognised was the Belted Galloways, were all hanging around in distinct groups, close to the path. Taking the ugly grey metal bridge over the railway lines the route heads diagonally to the left back to rejoin the riverbank. Having passed between a gap in a hedge the route gradually starts bending away from the riverside, photo 15, to head up to the village of Fen Ditton. 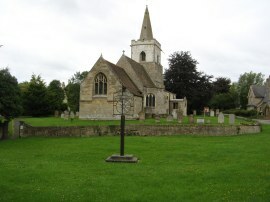 The path heads through a kissing gate and along a track to join the High Street which is followed up to the Church, photo 16 where the route turns to the left along Church Street. At the end of Church Street, where the road bends to the left the route continues ahead across a playing field and through a hedge to join a field edge path with houses on the left. Reaching the end of the field the route turns briefly to the left along a track, Field Lane, before turning to the right along another track that soon leads to a grassy field. 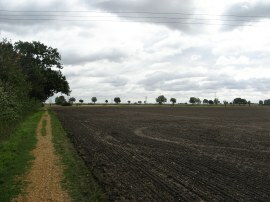 The Harcamlow Way crosses this field, passes an isolated and dilapidated house before gradually heading back to the river bank to pass under the A14 dual carriageway. 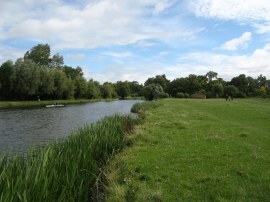 The route then heads along the riverbank for a short distance before joining a path that heads through a patch of scrubby trees running a few yards away from the river. 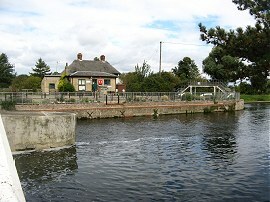 Shortly after passing alongside a wooden fence the route reaches a track close to Baits Bite Lock and Sluice, photo 17. 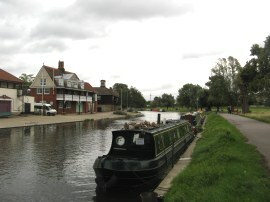 The footbridge at Baits Bite is the only pedestrian crossing between Chesterton and Waterbeach, this lack of river crossings being one of the reasons why this route ended up as long as it did. Here however the Harcamlow Way heads to the right, away from the lock to join a path that runs between fields, photo 18, up to the Horningsea Road. Reaching the road the route heads to the left, a newly built cycle path meaning that I did not have to walk along the road as I headed up into the village itself. Just before the village the route passes a very small cemetery where I stopped for a short rest on one of the two benches there, the hedges surrounding the cemetery keeping out some of the incessant wind. 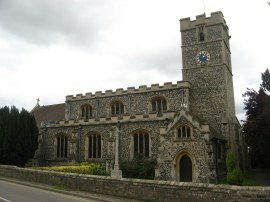 Continuing on I headed up the High Street, photo 19, and on through the quiet village. The High Street becomes the Clayhithe Road as the road leaves the village and after a short distance walking along the road side the route reaches a small parking area where I finished this stage of my walk along the Harcamlow Way, having walked 8.4 miles from Coton. 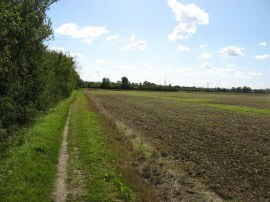 The Harcamlow Way heads off to the right along a track, photo 20, which leads to the village of Lode however I continued ahead, following the Fen Rivers Way along a footpath that heads over fields, taking a fairly straight course across the flat open fields, photo 21. A number of tractors were busy out in the fields and at one point I had to stop briefly while a tractor ploughed across the path directly in front of me. 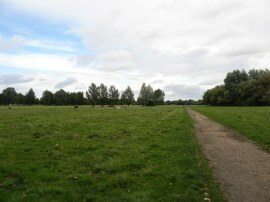 Drawing level with the buildings of Clayhithe Farm the route heads to the left, passing between the large food storage barns at the farm before bearing to the right along a track that leads back down to the River Cam, photo 22. Here I turned to the left to head the short distance up to the road so I could cross over the river, close to the Bridge Hotel pub. From the bridge I joined a cycle track that followed the course of the road towards the centre of the village, joining the road close to Waterbeach Station. 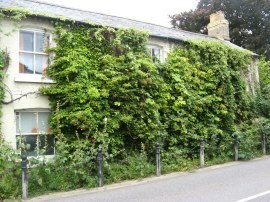 A little further down Station Road I passed an unusual house which was covered by hops, photo 23, and the Church of St John, photo 24. As I was heading through the village it started to rain which came as a surprise as rain had not been forecast and I had seen no evidence of rain clouds when crossing the wide open fields. At first I just put my fleece on, which is shower proof, however the rain soon became heavier and thus I stopped in a doorway near the village green, photo 25, to put my waterproof coat on and put the rain cover on my rucksack. At this point the rain stopped as suddenly it had started however I had only headed a short distance along Car Dyke Road and turned right into Cambridge Road when it really started pouring down. As I headed along the Cambridge Road the rain got heavier and as I approached the A10 the view over to Landbeach on the other side of the road disappeared from sight in a grey squall. My legs were getting quite wet at this point but I really didn't want to get my waterproof trousers out so I stopped and had a lunch break under the lopsided trunk of a huge old willow tree, which along with the hedge underneath, made a perfect shelter from the rain. 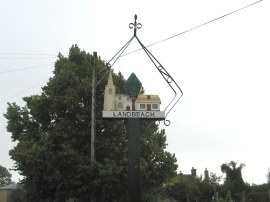 After about ten minutes the worst of the rain had blown over and I resumed my walk, heading across the A10 and along the Waterbeach Road which continues ahead on the other side of the main road into the village of Landbeach, photo 27. Reaching a crossroads I continued ahead along Cockfen Lane which I followed into Akemen Street, photo 27. Akeman Street is followed for about a mile until it eventually ends and becomes a broad grassy byway which has been closed to traffic. There are hardly any buildings of farms along Akeman Street and despite a good mile of road walking I was not passed by any vehicles at all. Towards the end of the byway I entered an area which was cultivated with raspberries and strawberries owned by the Chivers Fuit Farms of jam and jelly fame although the fruit is now grown for supermarkets rather than jam. 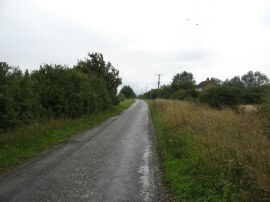 As I was heading along the byway the weather began to change and an area of blue sky gradually made its way towards me and by the time I reached Milton Road I was in bright sunshine. A large concrete block at the end of the byway made a perfect seat and I stopped to take off my coat and have a little snack in the warm sunshine; seldom have I been out when the weather has changed quite so quickly. 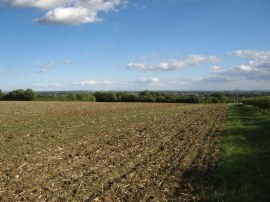 After my break I turned to the right, heading along the road towards the village of Impington. Shortly after passing an isolated house on the left I was able to cross over the road and join a field edge path that ran round to the edge of the village. Impington is a much larger village than the others I had passed through on this walk, having also merged with the neighbouring village of Histon. According to Wikipedia, "Over the years the two villages have grown and entwined together, to such an extent that many villagers today do not know where one ends and the other begins", and I certainly didn't. I followed the road through the village which becomes Burgoynes Road as it bends to the right by St Andrew's church, photo 28. A short distance on I turned to the left down New Road by the campus of Impington Village College before taking a footpath on the right that headed between houses to join a minor road which is followed down to the B1049, Bridge Road. Crossing this road I headed to the right along Station Road before soon heading to the left along Saffron Road. Reaching the end of the road I continued ahead along a footpath that runs behind houses to eventually reach the tracks of the Cambridgeshire Guided Busway, photo 29. Although this is marked on my map the route has been subject to numerous delays and despite carefully obeying the signs to look in both directions I subsequently found out the busway is still not operational (Sept 10). 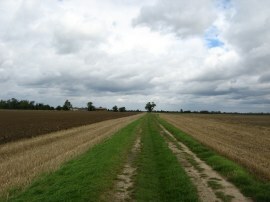 Having crossed the tracks I continued ahead along a path which heads over fields to the village of Girton, photo 30. A couple of areas besides the path had been planted with trees which made a good cover for a short break out of the strong wind. Reaching Girton the path heads through the buildings of Manor Farm to join Manor Farm Road which is followed for the short distance down to Oakington Road where I turned to the left. 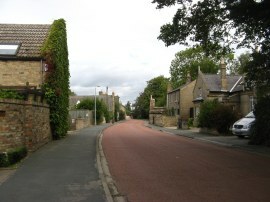 I followed the road through the village continuing ahead along the residential High Street when the main road bends round to the left. It may seem a lot of road walking but the majority was through villages where there were footpaths or along very quiet roads with limited traffic. The High Street leads to Washpit Road which is a dead end road that I followed for some distance down to its end at the point where A14 runs into the M11. I headed along the A14 for a short distance before first crossing the southbound A14 carriage way and then a slip road that leads to the northbound carriage way. The route then crosses another slip road before taking an underpass under the M11 and north bound carriageway of the A14. The road crossings safely negotiated I then continued ahead along a broad track which runs between fields to take a bridge over the A428. 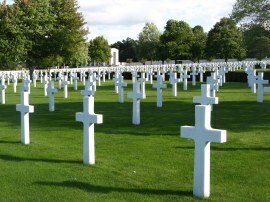 Once over the bridge the footpath leaves the track through a metal five bar gate on the right to join a footpath that runs along a field edge heading gently uphill towards the Cambridge Road with the Cambridge American Cemetery and Memorial growing ever closer on the horizon. I almost went off course at this point, only noticing the footpath left the track as I stopped to take a photo. Reaching the road I headed to the left and had a quick look round the cemetery, photo 31, which contains the remains of 3,812 of American military dead and a further 5,127 names that are recorded on the Tablets of the Missing. I then joined a footpath that runs along the right hand edge of the cemetery which continues heading uphill to reach the A1303 St Neots Road. Here I turned to the left for a short distance before joining a footpath on the right, opposite the main entrance to the front of the cemetery. This footpath heads besides a house before heading downhill between fields, photo 32, to reach the village of Coton from where it was just a short walk along the High Street back to my parking place. Reaching the car I had walked a total distance of 20.5 miles. I was still feeling quite fit at the end of the walk although I did seize up a bit on the car journey back home. I have now reached the northern most point of the Harcamlow Way and the next stage will see me gradually turn south to start the trek back to Roydon; hopefully I will be able to complete the route before the year end. The lack of footpaths in the area is still a problem though and I am struggling to find a decent circular walk for the next stage that doesn't involve an over long walk or have a lot of road walking. 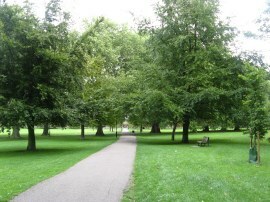 I have uploaded the route of the walk which can be accessed here Harcamlow Way 9 Route.